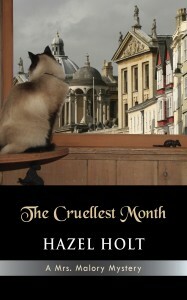 The Cruelest Month ($12.95, 196 pages, 5×8 Trade Paperback, ISBN: 978-1-60381-052-4) is the second book in a cozy mystery series by Hazel Holt. Widow Sheila Malory has been looking forward to her stay at the Bodleian Library in Oxford as a chance to research wartime women writers and catch up with old friends from her college years. Her relaxing idyll is interrupted when a librarian , Gwen Richmond, is crushed to death beneath collapsed bookshelves. Widow Sheila Malory has been looking forward to her stay at the Bodleian Library in Oxford as a chance to research wartime women writers and catch up with old friends from her college years, the one “purely happy” time in her whole life. Her relaxing idyll is interrupted when a librarian, Gwen Richmond, is crushed to death beneath collapsed bookshelves. After the “accident” proves to be murder, Mrs. Malory’s godson Tony, who also works in the library, asks her to help investigate. Gwen was manipulative and unpleasant, so there are no shortage of suspects. The dead woman’s World War II diary reveal dreadful truths that may lead to the killer; they will also force Mrs. Malory to revisit the past in a new and colder light. Hazel Holt was born in Birmingham, England, where she attended King Edward VI High School for Girls. She studied at Newnham College, Cambridge, and went on to work at the International African Institute in London, where she became acquainted with the novelist Barbara Pym, whose biography she later wrote. She also finished one of Pym’s novels after Pym died. Holt has also recently published My Dear Charlotte, a story that uses the actual language of Jane Austen’s letters to her sister Cassandra to construct a Regency murder mystery. Holt wrote her first novel in her sixties, and is a leading crime novelist. She is best known for her Mrs. Malory series. Her son is novelist Tom Holt. We eased our way through a group of young people who were engaged in a noisy argument about the relative merits of Bizet and Meyerbeer and emerged thankfully into the fresh air. It was still raining.